When I recently saw the new exhibition at the National Portrait Gallery advertised I was immediately stuck by the painting of Mary Robinson as 'Perdita'. This was partly because it's a very fine bit of 18th century portraiture, with all bravura and richness that epitomises that era, but also because it was unmistakably by John Hoppner. Hoppner (1758-1810) was one of the leading society portraitists of his day, and regularly patronized by royalty. Stylistically he was heavily indebted to Sir Joshua Reynolds, who was dominated the art scene as the first President of the Royal Academy. Hoppner is no longer as well known today but anyone who has spent any significant length of time in the Victorian House displays at the Cecil Higgins Art Gallery would have become very familiar with his striking portrait of 'Mary Boteler of Eastry Kent', 1786 (below). 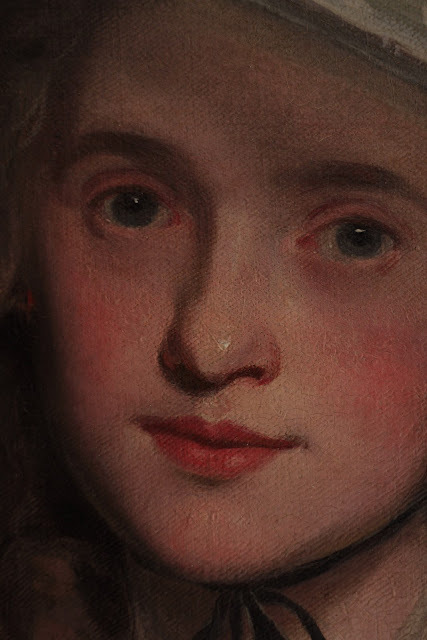 John Hoppner, 'Mary Boteler of Eastry Kent', 1786, detail. ﻿The portrait of Mary Boteler is not as opulent as that of Mary Robinson, but in its quietness and confident handling, the portrait is still very distinguished. The brooding clouds of the background were a regular feature in Hoppner's portraits: here they add a melodramatic undercurrent to the mood of the piece. The palette and lighting is also carefully muted. The greys of the lace and silk merge into the clouds, framing and emphasising the pinkness of the lips, cheeks and eyes. Light falls most strongly across the silk bow on the front of the dress but it only serves to lead the viewer in to the picture and up to the clear focus of the picture - the face, and that marvellous open expression. It is an emotive and touching portrait, and draws a sympathetic response to the sitter. Mary (nee Harvey) was her husband's second wife. His first, Sarah Fuller had died following the birth of their first son, but in contrast Mary went on to give William a further six sons and five daughters. The partner piece, a portrait of William Boteler, is far more serious in tone. With precision, Hoppner depicts Boteler's features and the details of his outfit. He pictured in a pose that is relaxed, but also professional, as if he has just turned from writing some official letter to give his attention to the viewer. Boteler was a surgeon and an amateur historian, a man whose brain was his sharpest tool, and the viewers focus is drawn just above his expression to the light upon his brow, to reflect on the mind behind the brow. The unfussiness of Hoppner's depiction of Boteler gives us a very matter-of-fact character. Instead of a picturesque backdrop of brooding clouds, the eye is halted by the wall of his study, and brought back to the man in front of us. The red fabric of the chair seems to serve a purpose too: the brightest patch of colour in the picture, it serves to detract from the pinks in the face. Where Mary's femininity is expressed through the soft reds of the lips and, more subtly, of the eyes, which are strikingly emotionally communicative, William's masculinity is reinforced by his lips seeming comparatively paler than the fabric, and his eyes are engaged in intelligent enquiry, rather than emotional expression.